Posted by Dr Dog. April 30th 2016. 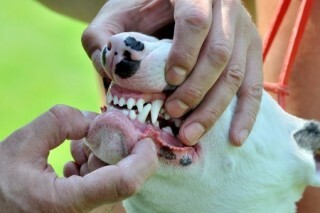 Great dog dental care is a significant part of taking care of your pet. Most pet owners accept that a certain amount of coat-grooming is required to keep a dog looking and feeling good. But it’s not just your dog’s fur that needs brushing. Many ‘how-to’ guides will recommend brushing your dog’s teeth regularly – maybe even daily – but the truth is most dog owners ignore this recommendation. Busy lives and other commitments mean a daily doggy dental routine is unrealistic. Chances are, you’re among them. There’s no shame in it but you dog’s dental health still needs consideration and there are alternatives to brushing your dog’s teeth. Even the most talented dogs will struggle to brush their own teeth. If you’re not going to, someone has to. Getting your dog’s teeth cleaned professionally might be the solution for you. The frequency will depend on your dog and his or her diet. For some dogs, a scale and polish once every six months will suffice, while others will need to go more frequently. Keep an eye out for plaque build-up and your nose out for when bad breath becomes unbearable. Be prepared to pay, though. Professional dog dentists don’t come cheap. One of the best ways to keep your dog’s teeth healthy is with a carefully considered diet. Opt for high-quality food that’s formulated for healthy teeth – your vet may be able to recommend some. Avoid giving your dog too many treats and resist the temptation to feed treats from the table and leftovers. 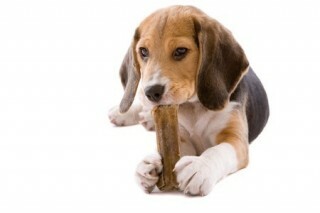 Chewing both dental chews and toys is the next best option, or using enzymatic gels. Mouthwashes and water additives are another good option as these are very hands-off. Brilliant if you have a particular grumpy pet. Dried food trumps wet food because wet food sticks to the teeth like superglue and is perfect fodder for those bacteria. The mechanical action of the dried food also helps clean the teeth. You can up the game even further by using prescription dental diets. Take a browse through the products available to you and arm yourself with your standard and what you’re setting out to achieve so can choose wisely. 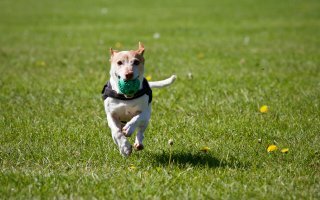 Use one or a combination of methods – just choose the ones that suit you and your pets. If you can’t find the time to brush your dog’s teeth every day, aim for an achievable goal, such as once a fortnight. Perhaps factor in tooth brushing before going on an extra long walk, to reward your dog for being good while you scrub away. Establishing a routine makes it more likely that your dog will behave while you’re brushing and that will make the task less arduous for you. If you decide to brush your dog’s teeth yourself, be patient and persevere. Just like at bath-time, it might take some getting used to for you and your pet – and there might be some mess. Make sure you use pet toothpaste – human toothpaste has a high fluoride level, which can cause upset stomachs in animals. Have everything ready and to hand. Push the toothpaste or gel into the bristles of the toothbrush, otherwise it falls off or is flicked everywhere but inside the mouth. Approach from the side, and hold the muzzle with one hand. Use the thumb to lift the jowl out of the way. Slide the toothbrush in and begin brushing in a circular motion ensuring all teeth and the gum line are brushed. Brush the incisors last. This tickles, and quite often pets will react to these been brushed, so it’s best to leave these until the end so you have a fighting chance of brushing the rest! Approach from the front using one hand to hold the muzzle and using the thumb to lift it up the lip. Again, brush in circular motions over the teeth and gum line. You don’t have to open your pet’s mouth as if they need to say ahh, and you don’t have to worry about brushing the insides of the teeth. The saliva coupled with the tongue action is enough to keep the insides of the teeth relatively clean. Bad breath isn’t only reason you need to stay on top of your dog’s dental health. Dental disease is perhaps one of the most common preventable health problems seen in our pets. It leads to smelly breath, bleeding gums, difficulty in eating, mouth abscesses, illness and pain. In its extreme the bacteria can enter the bloodstream, causing heart issues. That’s not to mention very unsightly teeth, and the expense involved when treatment is required. It’s not cute and it’s not cool.